If you’re looking for a lamp with USB port, you’ll probably want good functionality and style. That’s what I look for in a lamp. But you also have choices whether you want a table lamp, bedside lamp or desk lamp. With so many choices we look at the best available. Having such an easily accessible USB connector provides convenience in lots of rooms in your house. And since we all have so many devices that needing charging these days, it’s great to be able to charge them so easily. 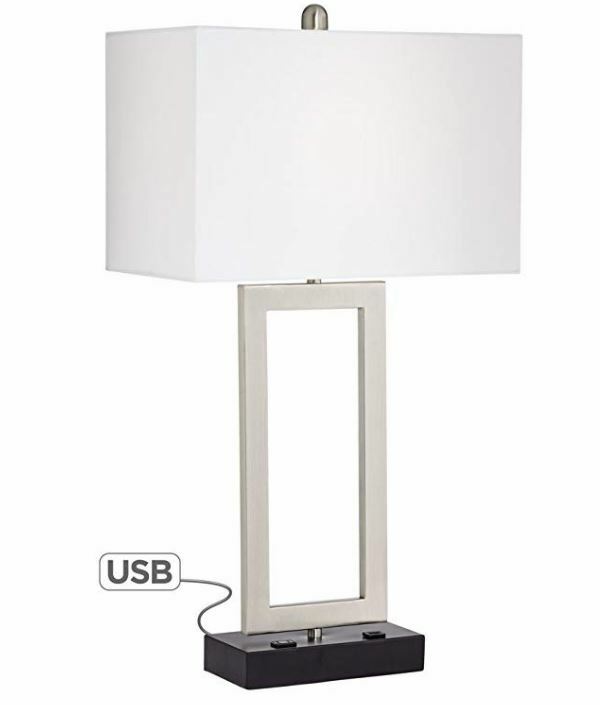 Click Here for this Floor Lamp with 2 USBs and Outlet. I love using lamps in my living room but since I spend more time in the evening during the week in my bedroom, it’s really this room where I can use the convenience of a lamp with a USB port. It’s the bedroom where I charge my smart phone and sometimes my tablet. We also charge robot toys like Zoomer Playful Pup. Sometimes we even charge gaming console controllers in the bedroom (I’m not sure why!). Once you’ve got one of these USB lamps you’ll be wanting more. And remember, for a few extra dollars you can choose a lamp with more than one USB port (you’ll really want to consider that option when you think about how many devices you charge in your home). These Tables Lamps (shown above) come as a set of two. They each provide one USB port at the back of the base. This can either be an advantage or disadvantage depending on how you want to use it. 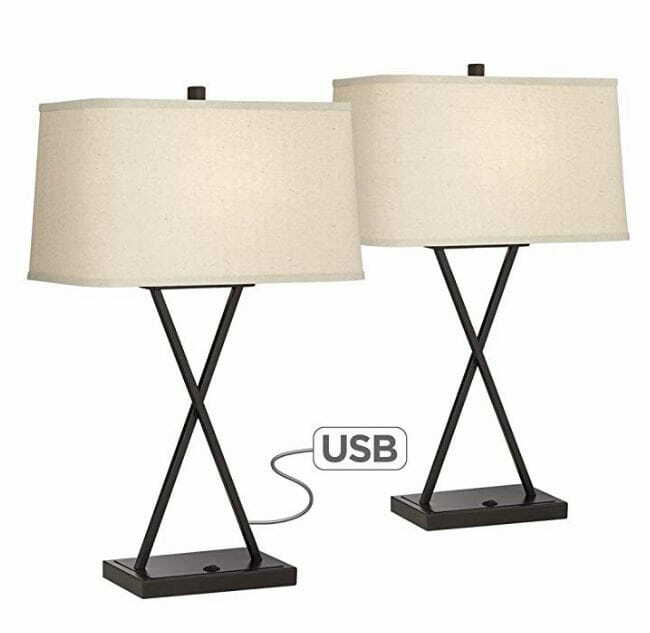 If you’re using these as table lamps in your living room you’ll appreciate having the USB port hidden at the back of the lamp base so it doesn’t interfere with the overall look. However, if you want to use these table lamps in the bedroom you may find it inconvenient having the charging point for your phone at the rear. See the section below on other Bedside Lamps with USB Ports). Each lamp stands 26 1/2″ tall. Each of the lamp shades is 15″ across the top and 16″ across the lower side of the shade. The lamp base measures 9″ wide and 8″ deep. The overall weight of each lamp is 4.8 lbs. The base of these stylish lamps is metal construction with a bronze finish. The shades are made from a good quality fabric. Each lamp comes with a 9.5 Watt standard-medium base LED bulb. These bulbs are comparable to a 60 Watt incandescent. The lamps can use up to maximum 150 Watt bulbs. This incredibly stylish Industrial-Look Table Lamp with USB Port is sure to suit your home or office. It looks great in a living room or on a console table in a hallway. The base is 8 inches across and the glass shade is 6 1/2 inches high. Overall the lamp weighs 12 lbs. The lamp is a metal construction with a bronze finish. You’ll get a 7 1/2 foot brown electrical cord. You get a built-in 5V DC 2A USB port in the lamp base. With this lamp you’ll get one 7 watt standard base LED bulb included (2200K). And there’s a on-off rocker switch on the top surface of the base. This LED desk lamp with USB port includes 4 lighting modes and 5-level dimmer. The modern design includes the touch controls vertically above the base. The base is solid and the lamp is sturdy. The lighting modes offer bright white through to a warmer golden color which is suitable for the evening. The color temp is 2500-7000K. The LED light consists of 27 LEDs in 3 rows. The outer two rows of 9 LEDs in each row are white. The middle row of 9 LEDs is yellow. The lamp includes eye protection from glare. And you get the convenience of a 60 minutes auto timer to turn the lamp off. You get one USB port included on the side of the lamp. It’s a 5V 2amp USB connection. The foldable arm makes it easy to use. 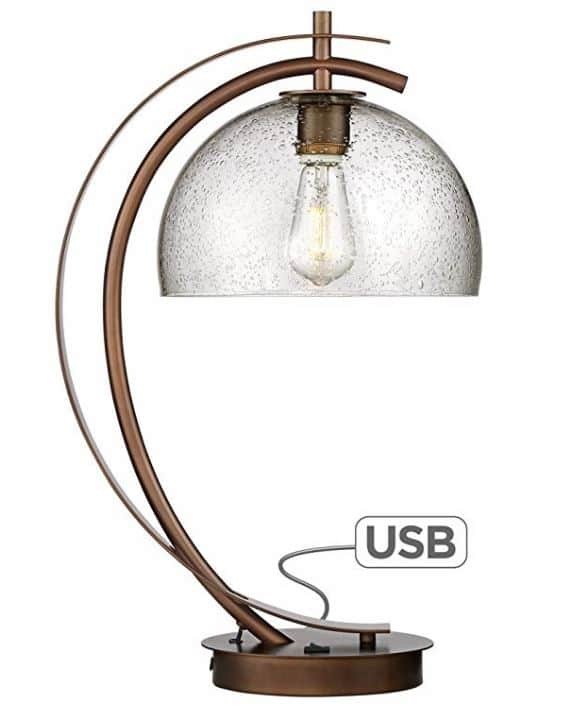 This sleek lamp with USB port is idea on a desk but you could use it in other places around the home too. It makes an ideal gift for someone who like modern decor. The dimensions of this lamp are: 18 1/2 x 7 x 2 1/2 inches. It weighs 2.9 lbs. 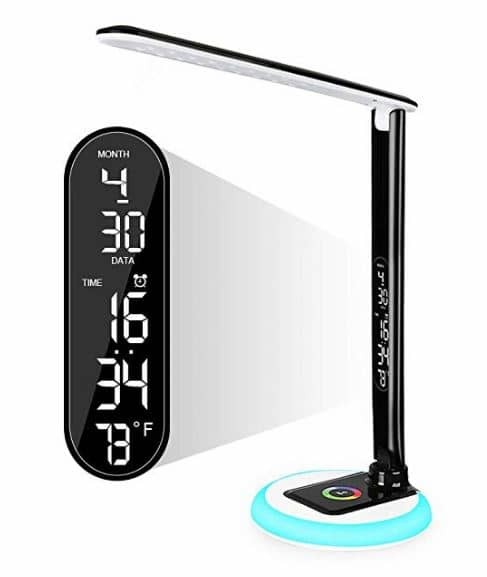 This desk lamp with USB port also includes a LCD display with the date, time, alarm and temperature. The light ring on the base of the lamp changes color. You can choose from 256 colors or have it alternate through the colors automatically. The touch control to change the colors is on the base itself. You get a 5V 1amp USB charging port on this lamp located at the back of the base. And you get 3 different brightness controls ranging between 30%-100%. The foldable arm makes it easy to position whether you’re using it as a desk lamp or as a bedside lamp. The lamp weighs 2.53 lbs. This multipurpose lamp is the perfect gift for someone who has everything. This bedside lamp with USB charging port is available with the option of 1 or 2 USB ports. They are 5V 2amp USB ports. Instead of a switch this lamp includes a stylish silver chain to turn the lamp on or off. The lamp is sturdy and does not tip over when you use the chain to activate it. The overall dimensions of the lamp are 5.3 x 5.3 x 14.5 inches. It weighs 1.8 lbs. The base is a dark brown wood and the shade is made from fabric. This is a high quality lamp with USB port. It can be used on a nightstand or as a table lamp in your living room or study. This lamp is not dimmable. However, the shade gives a nice subtle light for the bedroom if you use a bulb with lower wattage. This lamp does not come with a bulb but you could easily use a smart bulb in it to give you extra features. This bedside lamp does not include a USB port but it does provide a 2-prong outlet. I’ve included it here because it is very popular and you can still plug your phone charger into the outlet for charging. This lamp comes in 9 different color shades. You get to choose from hot pink, teal, blue, purple and more traditional neutral colors. It is a reasonable price and a high quality lamp. The brushed steel base contains the outlet. The lamp takes a 60 Watt bulb which is not included. It uses a pull chain to operate on and off. You’ll find the lamp is 19.5 inches tall and 8.5 inches wide. It weighs 3.6 lbs. You may want the convenience of an outlet as well as a USB charging port on your lamp. This lamp above looks stylish for the living room or bedroom. It comes with one 2 amp USB port and one outlet located on the front (top surface) of the lamp base. The lamp can take up to a 150 Watt bulb (not included). The vertical metal part of the base is a brushed steel finish and the pedestal is a black metal finish. The shade is white. Overall this lamp with USB port and outlet is 28 1/2 inches in height. The rectangle lamp shade is 16 W x 9 D x 10 1/2″ H inches. The lamp weighs 8.14 lbs. This is a high quality lamp and because of the shape of the lamp shade is it perfect for sitting at the back of a nightstand or side table against a wall so you save space on your table. This lamp includes a 2 amp USB charging port along with an outlet. The lamp base consists of a brushed nickel metal finish. And the shade is a white linen. The overall lamp height is 21 inches. The lamp base is 8 inches wide. The drum shade is 10 1/2 W x 6 1/2 H inches. Overall the weight is 5 lbs. This lamp uses up to 150 Watt bulb (not included). You also get a on-off rocker switch on base. 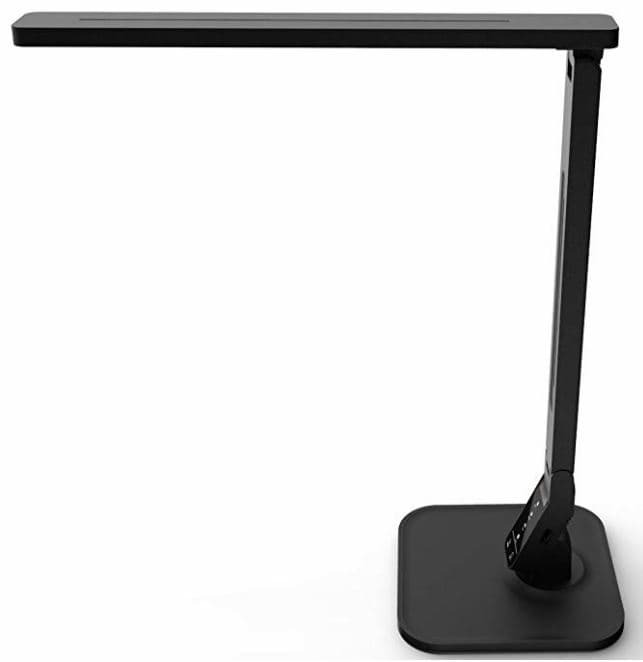 This LED Shelf Floor Lamp with USB port is perfect for placing everything, including your phone and tablet. Include decor items as well as devices. 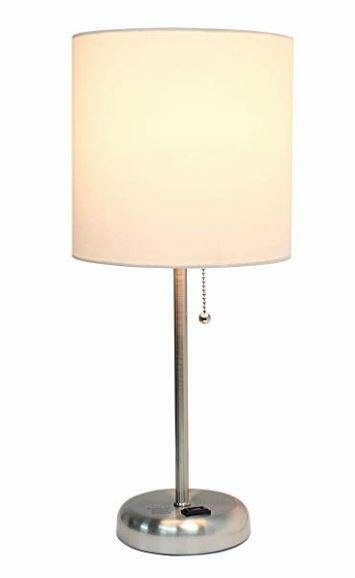 This floor lamp is perfect for the living room or the bedroom. You can place it in a corner to make maximum use of space. This floor lamp is perfect in a guest room because it adds extra shelves for lots of bits and pieces. The height of this floor lamp is 63 inches. Each of the 3 shelves is 10 1/4 inches wide. The floor lamp weighs 12.75 lbs. This is a very convenient floor lamp which doubles as a piece of furniture. The shelves are so handy. You’ll get this floor lamp with a 9.5 Watt, 800 lumen power saving LED bulb included. The color temp is 3,000K warm white. The lamp is not dimmable. A pull-chain is provided to turn the light on or off. You could also pair this with a smart outlet to control the on/off control from your smartphone but you’ll need to buy the smart plug separately (see here). This shelf floor lamp includes 2 USB charging ports and an outlet on the top display shelf. The shelf includes a stand for your phone and tablet to sit while charging. If you prefer a darker color in your decor, you can get a black version of this floor lamp. However, the top lamp part is still a light colored shade. The stand and shelves are black. If you click in the image above it will take to you more details including the black color option. If you’re looking for a floor lamp with the convenience of a tray table to place your phone for charging, then this one is ideal. You get a 5V 2amp USB charging port included, along with an outlet. The floor lamp is a metal construction with satin steel finish. The tray table is made from glass but the USB and outlet are located in a metal component in the center of the glass. 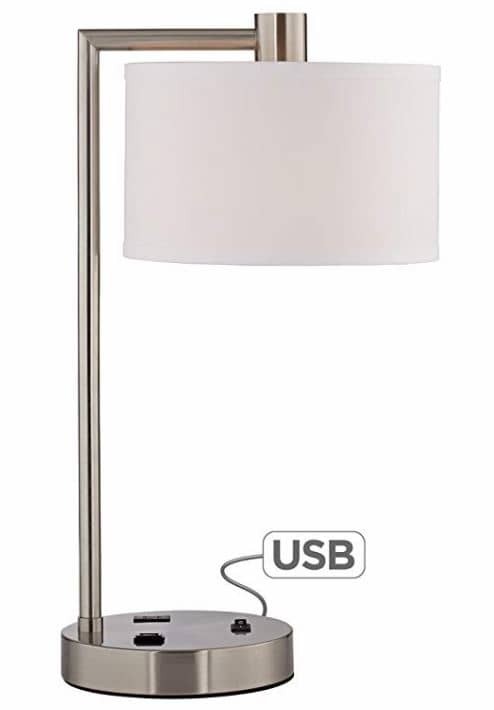 The height of this floor lamp with USB port and outlet is 56 1/2 inches. The lamp weighs 18.48 lbs. This lamp uses a maximum of 150 Watt bulb. The bulb is not included. The external part of the shape is fabric for a stylish appearance. The lamp features a pull chain to turn it on and off. 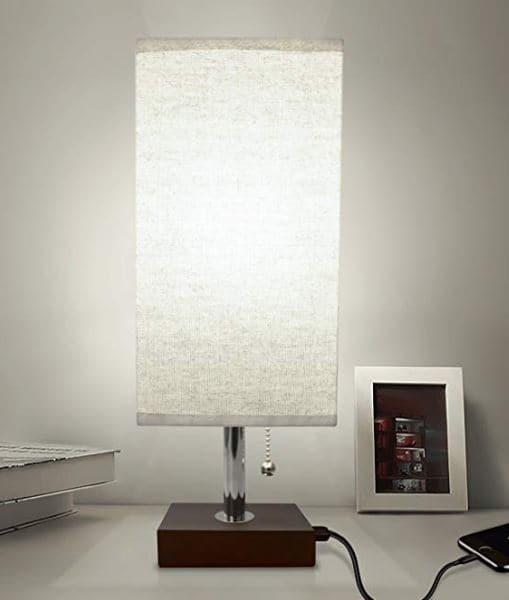 This is a well-built high quality lamp that is sturdy yet provides contemporary style to your room. ✅ Click on the Images above to see any of these lamps. Would you prefer a Himalayan Salt Lamp? They have health benefits as well as looking good. Looking for Outdoor Home Security Lights? ⇐ See more details here. Want to buy Smart Light Bulbs? ⇐ See the best here that don’t require a hub.